I love the the simple beauty of old skeleton keys. I often wonder what doors they've unlocked over the years. They seem to hold mysteries and answers simultaneously. My daughter's old armoire came with one, I photographed some at Madison Bouckville, and even collected a couple for Steampunk accessories. They've clearly been on my mind. Last night I carved some new stamps inspired by three little keys that have been sitting on my dresser beckoning me. I have a couple of plans for them, but first they needed to go on the cover of a Moleskine journal. What perfect reminders that we already have the keys to whatever we dream... a fitting place to jot down our plans and thoughts, don't you think? I made one to replace the journal I just filled up, and I'll have some in my shop, too. I'd like to believe that the doors you wish to unlock are just waiting for the key you already hold. Have a wonderful start to your week! I love old keys, too, and your carvings are fantastic! What a great job, skeleton keys are beautiful. I LOVE old keys. All our furniture from my parents uses them.....but every door has a different one....it takes me forever to open the 12 drawers/cabinets on the hutch! Gorgeous stamps! 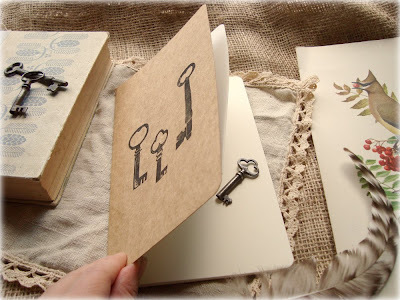 They look wonderful on your journal creation. 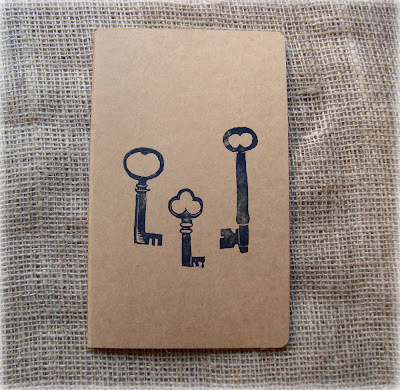 I love the inspiration and share your affinity for the mystery and history of skeleton keys. My grandfather found a keyring of skeleton keys out in the desert and I ended up with them. Oh the stories I could come up with for those keys! I love how you just "carve some stamps" like it is no big deal. :) Your designs are beautiful. You've added a touch of magic to my start of the week, thank you so much my friend. You have unlocked so many treasures and memories through your art, photography and life dear maya. The detail you achieve in your carving is just exquisite. How about a little key cupboard for our hallways adorned by your print. so very special...colors and feel ! just gorgeous! there is just something mysterious about them, isn't there? thank you for your kind comments on my newly born blog. i appreciate your words of encouragement so much! it looks wonderful! love it! Good morning Maya! Beautiful carvings! I love all your photos, but the first one with the lace and the burlap and the vintage books... and did I mention the feather? Truly wonderful. 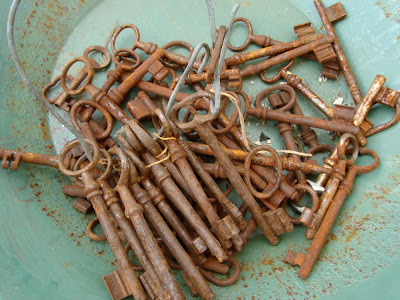 how lovely, the rusty old keys are so gorgeous! Your stamp carvings always wildly impress me. I keep thinking, "She carved those...by HAND???" Love old keys! I've been thinking of using some as inspiration for a new painting! thanks for the post! You just took down a link on your sidebar to a great blog that I wanted to revisit. I think it was call I made it myself.blogspot or something like that. She has a really cool flip book on her page that said "I 'd rather be blogging" Can you help? YOU have a wonderful start to YOUR week. Just wanted to throw some love back at you. FunkyMommy -I tend to rotate that Enjoy section in the sidebar frequently or it would be a mile long! http://justsomethingimade.com/ is the blog you're looking for and Cathe (the author) just put up another great project I just tweeted about. Your carving is a perfect embodiment of the skeleton key--mystery and purpose and promise all in one image. I love the metaphor! "I'd like to believe that the doors you wish to unlock are just waiting for the key you already hold." I really liked your blog! Please come visit my site Phone Directory Of Madison City Wisconsin WI State when you got time. I really liked your blog! Please come visit my site Business Reviews Of Madison City when you got time.